Hitachi supports your production innovation with its advanced technologies focusing on energy saving. Since started with 75kW (100HP) piston-type compressors launched in 1911, Hitachi has been acting as a leader of air compressor industry and providing excellent qualities to the customers. Our big challenge in recent years is "effective use of energy" to promoting both environmental conservation and cost saving. In 1993, Hitachi released the world's first variable rotating speed compressors by inverter control, and subsequently introduced certain flagship products. 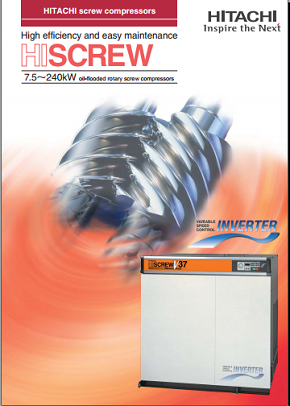 Now, we are launching the ɹɹɹɹɹ 2000 Series (7.5kWʙ75kW) as the brand-new models to satisfy customers' relentless demands. We believe theɹɹɹɹɹ 2000 Series compressor will be a reliable partner for achieving your advanced production innovation.